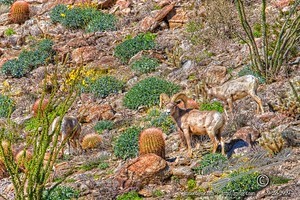 Big Horn Sheep – Not everything is flowers. I am getting ready to head out to the desert this week and shoot whatever the spring has brought to the Southern California deserts, usually aiming at the new growth. Ahhh But! I am also a very opportunistic photographer. This image was from a previous spring jaunt into the barren land with a friend who also possesses the eyes of an eagle. He spotted this group of Big Horn Sheep from quite a distance, pointed them out to me, like a hunter siccing a dog onto a prey. So I started walking towards these sheep, at an angle, moving closer towards them every step, but not directly towards them. That angled approach kept them from being spooked, and hightailing it for higher ground. In the end, this is the best I could do. Notice the flowers, and the green all around the sheep. The flowers were the target of the day, the sheep was the true bonus, and best images of the day. This entry was posted in Fauna, Flora, Flowers, Landscape, Nature, Purchasable - As Art Prints. Bookmark the permalink.